This is the time of year that we wrap up the summer terms, bring the previous academic year to a close, and look forward to welcoming a new class of students for the fall semester. It seems like a good time to look back at some of UIT's accomplishments over the last year while also providing a reminder of some of these features and services that will be useful in the coming course of study. Read more. Online learning seems ubiquitous these days. UNT has for years been a leader in online course delivery via course management systems like Blackboard Learn. Technologies such as Panopto can record a live lesson or lecture for easy playback by UNT students. Likewise, the university's subscription to the lynda.com service provides thousands of online videos for instruction on topics from photo editing to project management. A google search will turn up YouTube videos on how to do just about anything, including multiple ways to skin a cat as horrific as that might be in actuality. (Further searching, however, indicates that there is no apparent accounting system for taste, other than one possible publication on the topic.) Read more. The keynote speaker for I.T. Works! 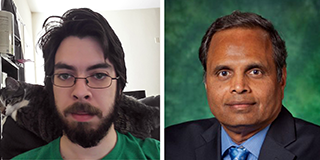 Conference Day is Robert "Rob" Rash, president and CEO, Olympia Consulting, LLC, and UNT alumnus, said Abraham John, senior director, Administrative IT Services and conference day planner. Read more. Help Desk FYI: Back-to-School Techno Tips! The fall semester is just around the corner, so read the five Techno Tips for new students, and refreshers for returning students. Read more. So, you’re standing there checking social media on your smartphone and look up to see your mom, dad, grandparent or a stranger having a heart attack! You call 911, of course, but what if a mobile app on the phone in your hand could cut the response time from minutes to seconds? Read more. The word cryptocurrency has become more recognizable than ever before. An increasing number of people who use various cryptocurrencies and the different kinds of services associated with it make the industry more stable than it was yesterday. This article intends to cover all the main aspects about cryptocurrency and help you understand how and why people use it. Read more. Catch up with Administrative IT Services in this month's newsletter with articles about password manager apps, the importance of using a secured wireless network and more. Read more. I call them iGen. Born between 1995 and 2012, members of this generation are growing up with smartphones, have an Instagram account before they start high school, and do not remember a time before the internet. The Millennials grew up with the web as well, but it wasn’t ever-present in their lives, at hand at all times, day and night. iGen’s oldest members were early adolescents when the iPhone was introduced, in 2007, and high-school students when the iPad entered the scene, in 2010. A 2017 survey of more than 5,000 American teens found that three out of four owned an iPhone. Read more.